They are much more than my primary makeup artists. They are collaborators, in every sense of the word. My favorite quote, "Oh I see, you're the brains and Jordan is the brawn," is a pretty accurate observation. They do hair, makeup, styling, lighting, art direction, and on and on. Really, as long as I keep the camera focused, they'll make sure I look good. And I use auto-focus! Their influence can be seen all over my website, but only by me. Nowhere are their contributions specifically noted - they are, by far, too numerous to mention. Just assume that if you love a photo, one of them had a hand in creating it. This blog probably won't reach the billion people who saw Natalie's speech, but it's the best I can do. Ivy is at heart a natural art director. She's a fountain of ideas. Last fall we were shooting Jenna Lee Crowl's actor comp card. I wanted to do a straight business shot, and Ivy suggested a softer approach. "Have her eating some yogurt." I dismissed it out of hand, but she was not deterred. To get her off my back, I took the shot, and loved it. Then it was time for the mom shot, and Ivy walked off and returned with a ready-for-camera little boy and handed him a cupcake. When we needed a dance shot Ivy suggested an alley for the location. Once again I dismissed it, this time as too grungy (you'd really think I'd have learned my lesson years ago). She convinced me that the contrast would work, and she even helped with the pose! Finally, as I was taking the "legs" shot, Ivy was directing Jenna on position. Pamela has collaborated with me on Dancers Among Us from the very beginning. Her participation was invaluable in its early stages, and I still rely heavily on her advice to this day. Early on she volunteered her time to accompany me on several shoots, and she helped me communicate with the dancers - as a former dancer, she was able to speak their language while I was learning on the fly. My very favorite photo could not have happened without her involvement. 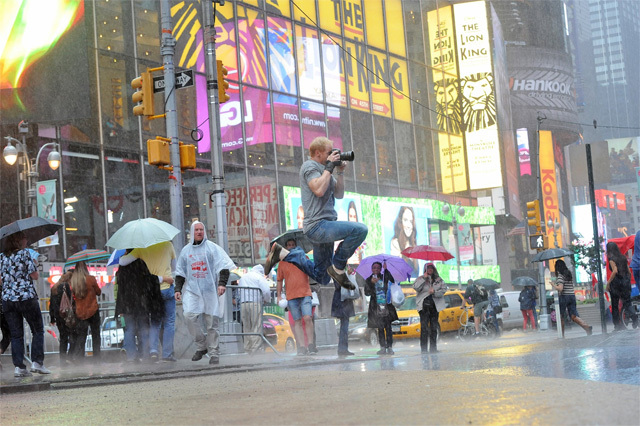 The plan was to shoot Annmaria Mazzini, of the Paul Taylor Dance Company, jumping over a puddle in a rainstorm. Pamela offered to join us on the shoot, despite being pregnant AND having dinner plans that evening. As the rain poured down, she held an umbrella over my camera without protecting herself. While she was getting drenched she was shouting technical notes to Annmaria in between jumps. This went on for twenty excruciating minutes. The resulting image has been seen all over the world, with only my name attached. These are just two of literally hundreds of examples of their participation in my process. Not to mention the positive influence of working with close friends who make me laugh. After today I will go back to taking full credit for everything. But in this moment, I'm telling it like it is. Thank you! 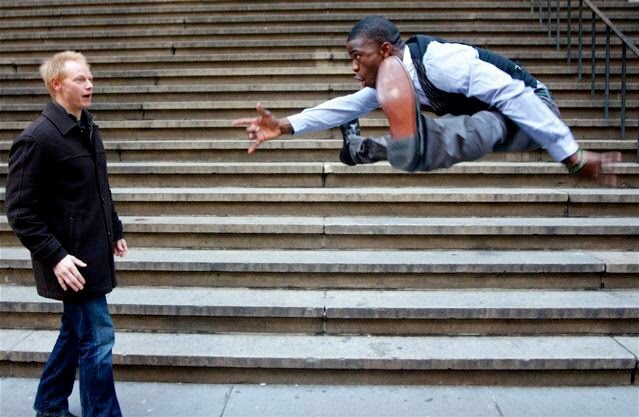 Spiderman's Heather Lang was a perfect partner in crime for this Dancers Among Us shoot. We bought "the nastiest lookin' thing" (direct quote) from a Chinatown fish market to feature in the photographs, and when I asked her to put stinky sardines in her mouth, she didn't even flinch! I'm embarrassed to say she's braver than me (which I guess is appropriate for a dancer in Spiderman). 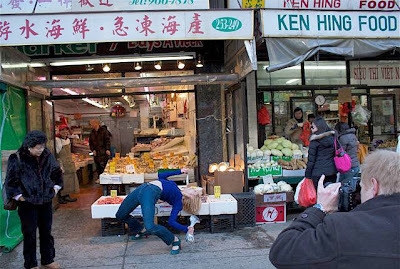 Dancers Among Us: In Chinatown from Jordan Matter on Vimeo. Video by Caleb Custer of Design Brooklyn. After shooting Spiderman's Heather Lang in Chinatown (see last week's blog) for Dancers Among Us, I sped downtown to shoot AdéChiké Torbert, of So You Think You Can Dance fame. I was trailed by Design Brooklyn's videographer, Caleb Custer, who has been filming recent Dancers Among Us shoots for my be ALIVE web video series. We released the first video last week, and the response was spectacular. 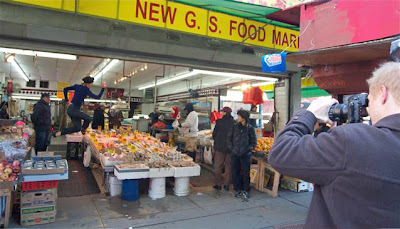 This week's video will feature Heather's Chinatown shoot - I'll post it to my blog and Facebook fan page. 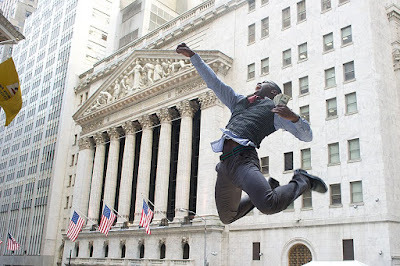 For my shoot with Ade, as we arrived on Wall Street, we were in a rush. There was very little time before sunset, so no time for wining and dining. 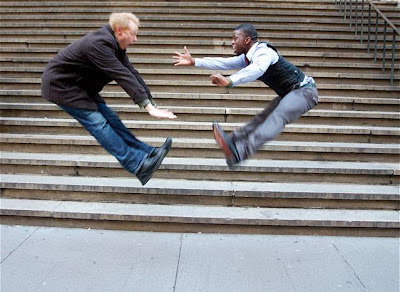 I asked Ade to wear a business suit, and we jumped right in (pun intended). "What would you like to do, Ade?" "Well, I do like to jump." Now, I've photographed many of the top dancers in NYC, and they almost all like to jump. But there's a difference between liking to jump and exploding through the stratosphere. After I saw Ade defy gravity a few times, I tried to do it myself. I knew I wanted to shoot in front of the Stock Exchange, and now it was clear there would be a fantastic jump involved. I assumed there would be throngs of Wall Streeters pouring into the square at 4pm, but I was wrong (maybe there are advantages to scouting locations ahead of time). There were only tourists, and not many at that. 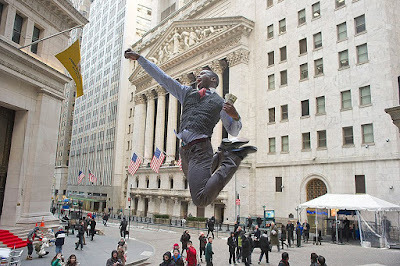 I handed Ade a wad of cash and asked him to jump as if he had just received a government bailout. I cropped out the empty square. I liked the celebratory feel of his jump, but I needed people in the shot to give it context. So I called out to anyone within earshot. "There's a dancer over here doing an amazing jump. Check it out. Grab your cameras." They didn't look all that enthusiastic. "He's famous. Do you watch So You Think You Can Dance?" Cameras appeared out of nowhere, and a crowd gathered. Gotta love pop culture. 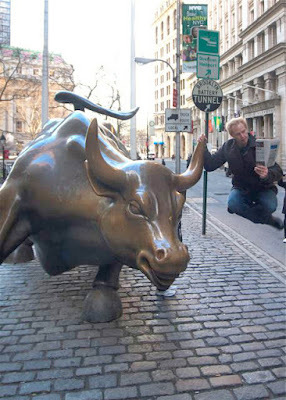 Next, the bull! No self-respecting photographer can do a Wall Street shoot without incorporating the bull somehow. 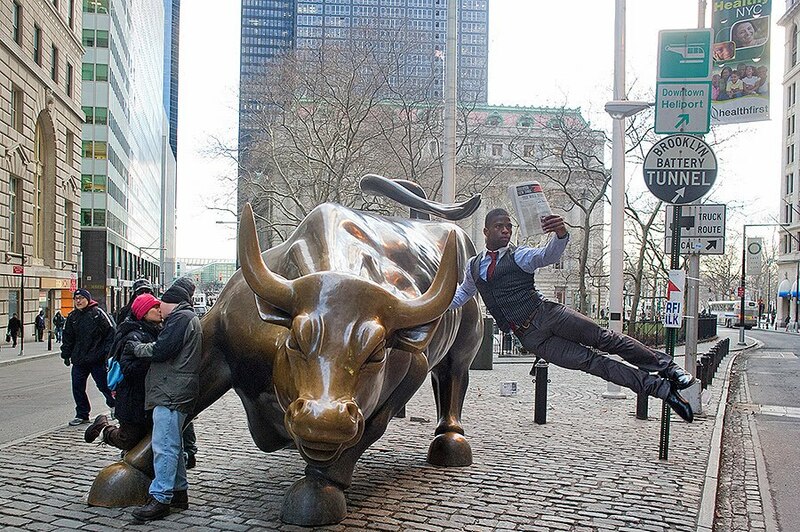 I wanted Ade to look like he was casually reading the Wall Street Journal while levitating in mid-air. It was too cold and windy to take time describing it, so I just tried to show him instead. We took a few shots, but once again there was nobody in sight. Then I turned around and noticed that a crowd had gathered behind me. "Anybody want to be in the shot?" A couple volunteered, which was great except that two people don't really fill a frame, unless they're doing something fun. "How about kissing each other for five minutes while I shoot? Is that okay?" Next, I wanted to borrow someone's car and do a traffic jam shot, but surprisingly there was no traffic. This was bizarre - there was nobody anywhere on Wall Street at rush hour. So we hopped on the subway and headed uptown. Finally there were people around. 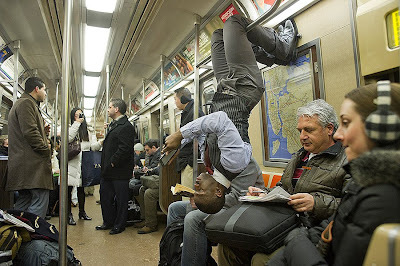 I borrowed a woman's Kindle and asked Ade to hang upside down. Nobody flinched. Eventually his legs began to get numb. My long and amazingly creative day was finally over. I celebrated with an impromptu dance in the aisle with Ade, which Geoff captured on video. If you want to see some really white dancing, take a look. New Dancers Among Us Video! Strangely, I find the persistence of Chumbawamba's "Tubthumping" an apt anthem for my approach to my Dancers Among Us photographs. When I ask to shoot somewhere, I get turned down, but I ask again. And again. And then I sneak in! And get kicked out. This time, it took buying everyone lunch. 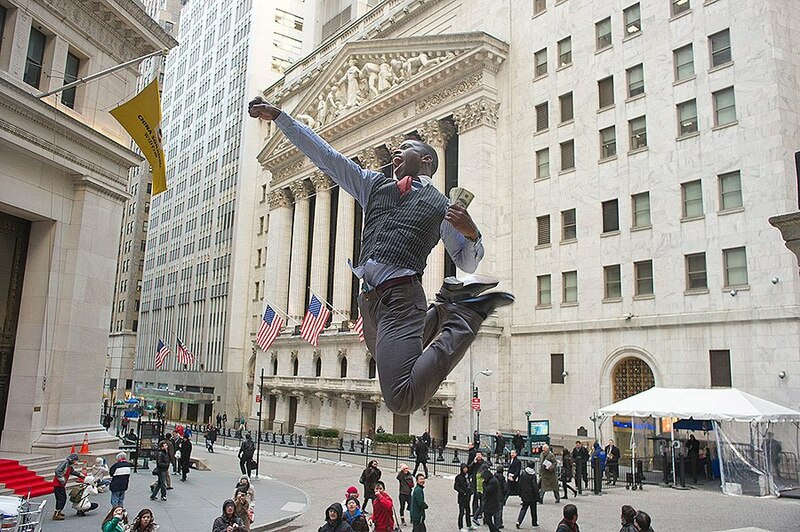 Enjoy the video, featuring Michael McBride, a dancer with Alvin Ailey American Dance Theater! This month I've had the good fortune to be photographed by behind-the-scenes documentarian Geoff Legg. He's responsible for many of the fantastic photos you've seen in recent blogs. I'm lucky I came up with the idea for Dancers Among Us before he did, because he's got a future as a prominent dance photographer if he wants it. Once again, his images will help tell this story. 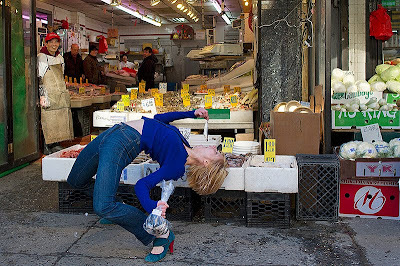 Last week I spent the afternoon in Chinatown shooting Dancers Among Us with Heather Lang, a performer in the Broadway show "Spiderman." Caleb Custer, from Design Brooklyn, was videotaping the shoot for my upcoming series of web videos (this week I'm releasing the first video- keep an eye on my Facebook fan page for a post). As usual, I had no specific plans. Heather has great energy, so I figured we'd just improvise. I was attracted to the colors in the streets, but I didn't see a lot of potential for interesting scenarios. Plus it was (once again) really cold and windy, and I didn't think Spiderman could stand to lose another cast member to injury. So I decided to keep the jumping to interior locations. I came across a store called Mercury. It had teddy bears in the window and a bed prominently displayed in the center of the room. That's irresistible! We walked inside and I asked if I could take a photo on their bed. Since the "yes" came so easily, I then asked if the young man behind the counter could join her. Yes again! I was loving Chinatown (maybe a language barrier was working in my favor). I turned to Heather, "You can't be wearing jeans, you're on a bed! Let's do it naked." Apparently there wasn't a language barrier after all, because everyone in the store stopped and stared at me (including Heather). "Okay, not a great idea. Do you sell pajamas?" Not only did they sell them, they had a pair that was custom fitted to Heather's body and perfectly matched the interior. I handed Heather a blue teddy bear and asked her to pretend it was Christmas morning. "And try not to break the bed when you land." Next I wanted to find a fish market. That would seem to be an easy task in Chinatown, but not in the winter. When we finally found one, I asked to borrow a hat, apron, coat, and gloves and have Heather jump around while holding a huge fish and spraying a hose. I didn't understand why my request was immediately and unequivocally denied. So I whipped out my big guns. 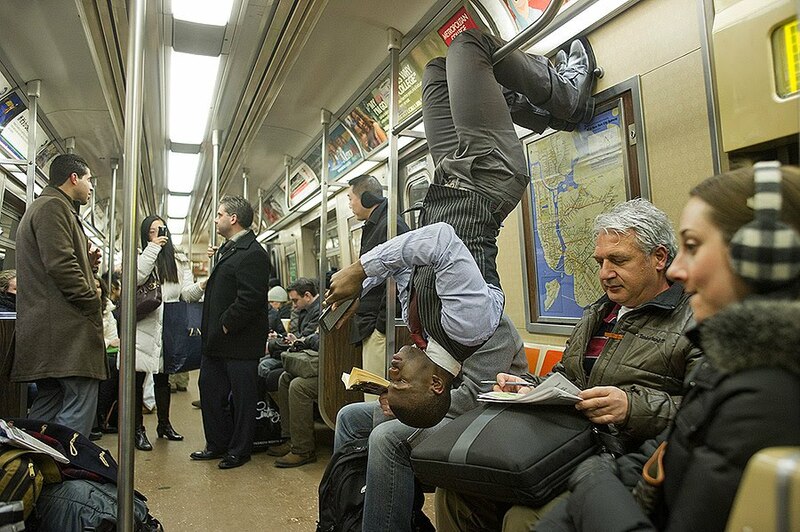 "Did you happen to see my four page spread in the NY Daily News? Here, let me show you." Needless to say, he was unimpressed. My offer of a monetary exchange was equally unimpressive. So we found another market and practiced the jump together outside. This time I wouldn't ask for permission. That didn't go over very well either. After two jumps, I heard a very loud, "Enough!" And my Nikon had decided to freeze up during those two jumps. So we returned to the original market with a new plan. 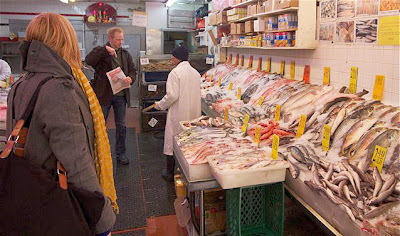 If we buy some fish and pose in the street, we should be able to fire off a bunch of shots before they scream at us. We decided on anchovies. Much to my surprise, Heather was willing to put one in her mouth. I asked her if she could eat the anchovy and do a back bend. We didn't get admonished at all. On the contrary, they invited us inside to shoot some more. This taught me a very valuable lesson- "leggy blond dancer" is an international language. 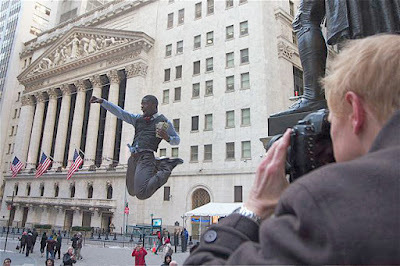 We said goodbye to Heather and sped downtown to meet Ade Chike for a sunset photo on Wall Street. Ade was a finalist on last season's So You Think You Can Dance. Next week I'll blog all about our adventures together, but here's a preview. I said, "So what would you like to do, Ade?" And he replied, "Well, I do like to jump!"